ESO builds and operates some of the most advanced telescopes on Earth including the Very Large Telescope (VLT) at the Paranal Observatory. These huge machines have made many fascinating discoveries about the Universe. Now, for the first time in its history, you can decide what to observe with the VLT, or even win an amazing trip to Chile’s breathtaking Atacama Desert to help make the observations yourself. The first of our two anniversary competitions is called Choose What the VLT Observes. Usually, astronomers have to prepare a detailed plan long in advance, describing why they want to use the VLT, and only a small fraction of them are given the chance. But for you, it’s going to be rather easier. ESO has already pre-selected some interesting celestial objects that are visible in the sky on the 50th anniversary of ESO — 5 October 2012 — and fit in VLT’s field of view . All you need to do is cast your vote for the object you like most. The one that gets the most votes will be observed using the VLT on the 50th anniversary day. We will draw a winner and ten runners up from among those who voted (you do not have to have voted for the winning object). The winner will receive one of the latest iPads and the runners up will receive ESO products including books, DVDs and other goodies. Next, what about visiting the VLT to help make the observations of the winning object yourself? For a chance to do this, enter our second competition, called Tweet Your Way to the VLT! We invite you to tweet (in any official language of an ESO Member State) the reason why you would like to visit the VLT at ESO’s Paranal Observatory. A panel of judges will pick the lucky winner, who will be offered a trip to Chile, including travel and accommodation. 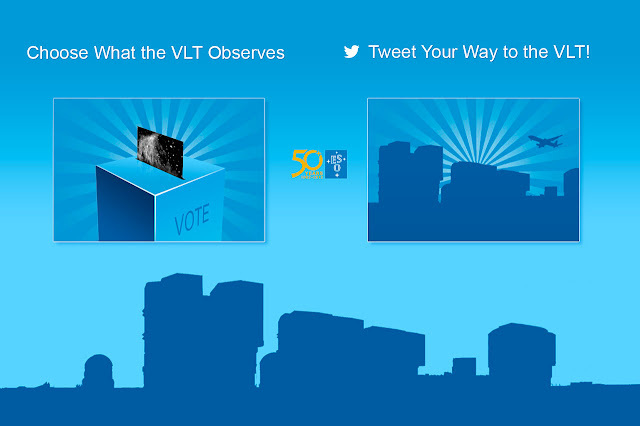 The winner will have the opportunity to visit the VLT in time for ESO’s 50th anniversary on 5 October 2012, and be the one who observes the selected object from the Choose What the VLT Observes competition. As part of our anniversary celebrations, the observations will also be streamed live to viewers around the world. The deadline for both competitions is 31 August 2012, at 23:59:59 CEST. More detailed information and rules for both competitions are available on the ESO website. The VLT is like a very powerful telephoto lens, so its field of view is tiny. This means that a large object like the Orion Nebula or the Carina Nebula would be far too big for the VLT to image in one shot. To help you, ESO has prepared black and white previews of the objects on the voting page, using older images from the Digitized Sky Survey. Of course, the final VLT image will look much better than the black and white preview.